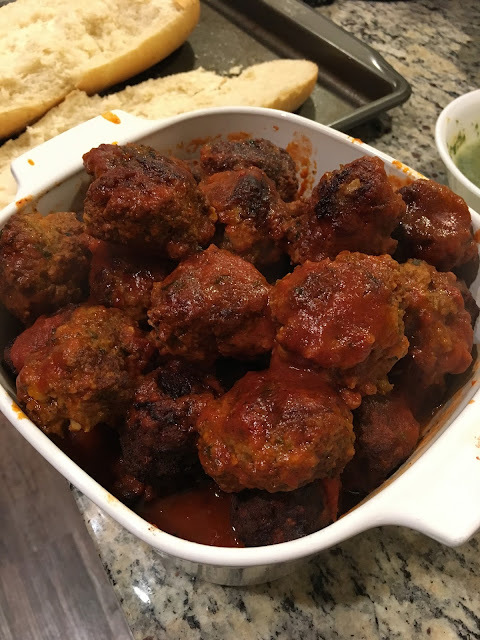 I was totally jonesin' for meatballs this week. The only ones I really love are the ones my grandmother and Aunt Jennie used to make, so a trip to the store was on my to-do list. There really is no recipe here. When I asked my Aunt Rosemarie (my father's sister, grandma's daughter) how she made them, she told me "Beef and pork, although I just do beef now, lots of garlic, salt, pepper, parsley, bread soaked in milk (a panade), eggs, and TONS of grated cheese. The more cheese, the better." The best ones are also made with ground veal, but I had a hard enough time finding ground pork in my grocery store. The next time I'll definitely have hit the butcher. Now, soaking actual bread in milk and then squeezing out the liquid is much better, but I didn't have bread, so I used the breadcrumbs. I did add milk though. The reason the bread is better is because it keeps everything more moist, the breadcrumbs make for a harder meatball - which I love, but still, go the panade route if you can.Also, I usually used my favorite Locatelli cheese, which is a salty pecorino romano, but my grocery store only had parmesan, so I used that instead. I can estimate measurements of the loose ingredients - four cups of grated cheese, a handful of parsley, a heaping teaspoon of salt and pepper, maybe a cup and a half of breadcrumbs. I just mix until it looks and feels right. See how helpful that was? This time I used Ed's cast iron skillet for frying, a first for me. 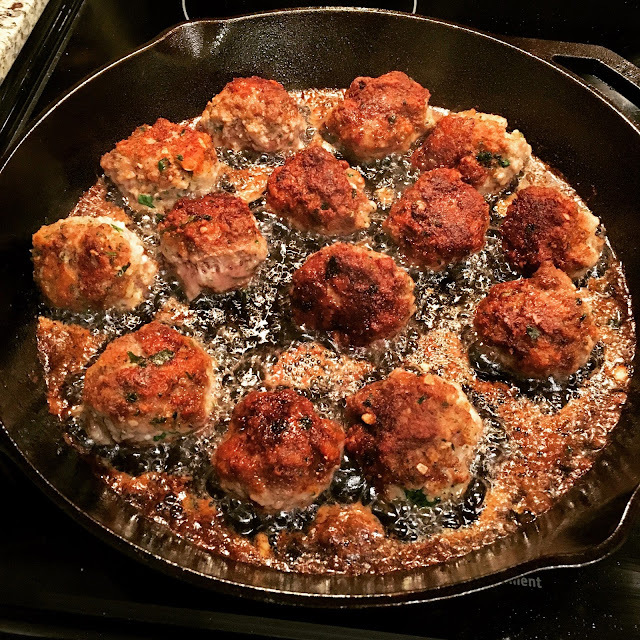 I poured about an inch of olive oil - must use olive oil, not regular oil, to get the best flavor - in the bottom, arranged all the meatballs, and let 'em cook. When they get really crispy on one side, turn them over. They might lose a little of their round shape - I push them down a tad to make sure the entire half gets in the olive oil - but no one will ever say a thing about what they look like. If they do, refuse to serve them! When we were kids we couldn't wait to have a fried meatball straight out of the frying pan. It's the same way today, those first few meatballs are the best. So you can drain them on paper towels or just polp them in your gravy and let them get all tomato-y. They'll get a little softer in the sauce, but they shouldn't fall apart. I made a lot but shared - Kim, her son, my mother - so I'll be making more again soon. They're great in a sandwich, and when you need a little something, a few of them make a great late-night snack. I’m making this recipe today! So I’m aiming for about 100 meat balls! Yay! Good luck! Hope you enjoy!